Wedding etiquette has changed so much over the years that we often receive questions about proper manners for a modern wedding. A lot of these questions are on the subject of wedding registries. Do you have questions about registering for your wedding? Well, you came to the right place! Why should I have a wedding registry? Some people think it’s “rude” to have a wedding registry. But it is absolutely not. A wedding registry allows people that are already planning on buying you a gift to see what you need. It also limits the number of duplicate gifts received. Do you really want four can openers and six toasters?? When should I register? We suggest registering about 6 months before your wedding date. The latest we suggest completing your registry is 3 months before your big day. Where should I register? 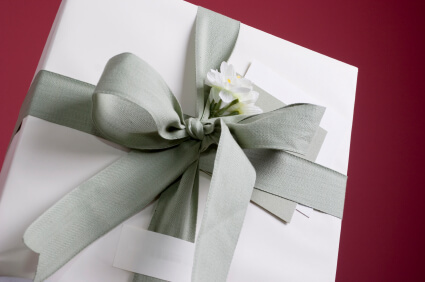 Choose between one and three stores that have wedding registries and that are accessible to your guests. What should I register for? Register for items you need for your home. Make sure you register for items that vary in price. The amount of items you should register for will depend on the number of guests invited to your wedding. You do not want to register for too many items because you might end up not getting the things you really want. How do I let people know where I am registered? It is considered improper etiquette to have your registry on your invitations… but there are other ways to let people know where you are registered. Have the hosts to any wedding showers you are having put your registry information on the shower invitations. Let your family know where you are registered so they can pass on the information if someone asks about getting you a gift. The best way to let people know about your registry is to have a wedding website that links to the registry. Then, you can print the URL on your invitations! Any other wedding registry questions? Ask us now!